So, you’ve made it. The last step in the Pace & Pattern Method. You’ve written a vision statement that connects with your big “why;” you’ve identified five simple intents to guide your decisions; you’ve chosen to say “yes” to just a few meaningful goals and created a plan for making them happen; you’ve designed a template for what you want your life to look and feel like (pulling weeds out of your schedule all along the way). And now, at last, you’re ready to jump in and start putting all those plans in motion. If you are just jumping in check out these links to get caught up! But just because this is a seasonal approach doesn’t mean we wait until three months have passed before checking in with our vision and goals. It’s so easy to get caught in the current of everyday life, living by reaction, that we forget to be proactive and to think about the “why.” This step is meant to help you plan your month, your week and your day with your vision in mind so you can sustain your goals. What you will need for this step: A favorite writing utensil, along with any other well-loved school supplies you have on hand; A Sustainable Goal-Setting Seasonal Guide or planner; and a quiet, peaceful place to work. Pull out your Pace & Pattern planner and flip to the month page. Reflection is powerful. Just the act of pulling back and taking a bird’s-eye view of our lives is enough to change us for the better. What didn’t go so great? What is one thing you plan to let go of next month? Fill in anything coming up that you want to remember: birthdays, weddings, assignments, trips etc., so you can get a good idea of what is coming your way this month. Write each of your intents down (the hope is that soon you’ll be able to do this from memory; if you can’t now, no worries! Flip back to your vision and intents), and think of a couple of concrete action items you can do this month to move towards making those intents a reality. Use your intents as a framework for making your big-picture to-do list for the month. These aren’t your goals (at least not yet) - limit yourself to writing just the essential few tasks you’ll be most satisfied to accomplish this month. Don’t cram too much in, and don’t get into the specifics just yet! Habits: Write down how many times you want to accomplish your habit this month. Rhythms: Fill in your calendar with days you plan to do your rhythm. Writing it down makes it more real. Planning your week is similar to planning your month, only more zoomed-in. I feel so much more ready for my week when I spend 30 minutes or so thinking through what’s coming up and what I would love to see happen. Don’t worry about writing in things that stay the same every week (unless writing everything down makes you happy!). Just add activities that you want to make sure you won’t forget. Doctor’s appointments, rhythms, meetings, coffee dates, etc. Write each of your intents down and make your to-do list for the week with those in mind. 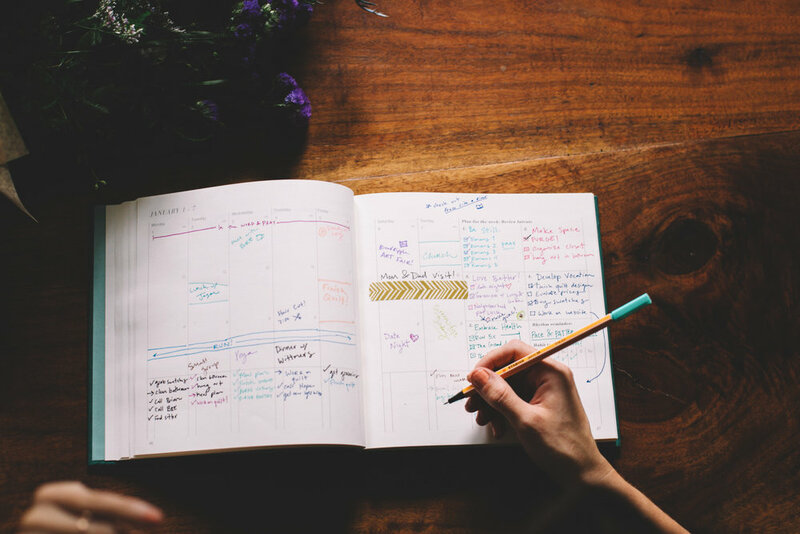 Flip back to your plan for the month and see what you can do this week to get closer to accomplishing your bigger action steps. Get a little more specific here, but don’t overdo it. Leave some margin in your week. Write down the progress you want to make towards your habits, rhythms, and projects for the week (I like to do this below the intent each one connects to). Lastly, take just a few minutes each morning to plan your day (this pairs perfectly with a cup of coffee). Look at your to-do list from yesterday and move anything that didn’t get done over to today (or another day, if that makes more sense). Look at any appointments or rhythms happening today. Finally, look over your plan for the week and make a to-do list for the day with your objectives for the week in mind. It is amazing how much more focused and enjoyable a day can feel when you just spend a couple minutes planning in the morning!